Before 1795: disciple of Tatsuoka Mansaku, his first two pen names were Machimoto Washichi and Matsumoto Washichi. 3rd lunar month of 1795: he worked in Ôsaka on the drama "Ichi-no-Tani Futaba Gunki". 1st lunar month of 1802: he took the name of Ichioka Washichi I and worked at the Kado no Shibai on the new year ni-no-kawari drama "Keisei Midori no Hayashi", which was produced by Anegawa Kamesaburô and celebrated the arrival in Ôsaka of the star Ichikawa Danzô IV. 1st lunar month of 1805: Washichi worked at the Kado no Shibai, along with Chikamatsu Tokuzô , on the new year ni-no-kawari drama "Koi Môde Kiyomizu Zakura", which was produced by Arashi Torasaburô. 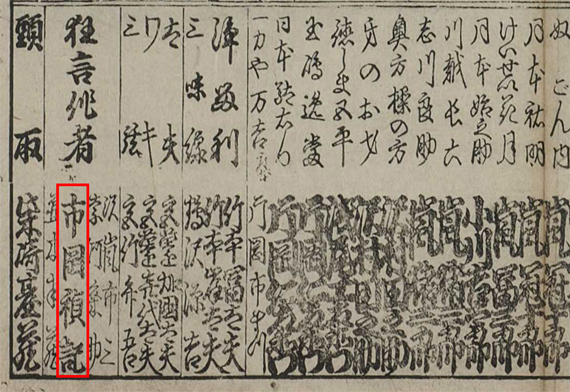 11th lunar month of 1805: Washichi worked in Kyôto at the Kitagawa no Shibai, along with Chikamatsu Tokuzô and Nagawa Kunisuke, on the kaomise drama "Shinshû Kawanakajima Kassen"; the main actors are Arashi Kichisaburô II, Onoe Koisaburô I, Onoe Shinshichi II, Kanô Minshi I, Arashi Izaburô I, Seki Sanjûrô I, Ichikawa Dannosuke III, Nakayama Yoshio I, Mimasu Tokujirô I and Nakamura Noshio III. 11th lunar month of 1806: Washichi worked in Kyôto at the Kitagawa no Shibai, along with his master Tatsuoka Mansaku , on the kaomise drama "Akiba Gongen Kaisen Banashi". 3rd lunar month of 1808: the drama "Hachijin Shugo no Honjô", which was originally written for the puppet theater and premiered in the 9th lunar month of 1807 in Ôsaka, was adapted for Kabuki by the sakusha Nagawa Kunisuke, Nagawa Tokusuke I and Washichi. It was staged in Kyôto at the Kitagawa no Shibai [casting]. 3rd day of the 9th lunar month of 1809 : his Master Tatsuoka Mansaku died in Ôsaka. Fall 1809: Washichi went to Edo with Ichikawa Ichizô I. 11th lunar month of 1809: Washichi worked at the Moritaza on the kaomise drama "Shitennô Futaba no Isaoshi". 11th lunar month of 1810: Washichi worked at the Moritaza, along with the tatesakusha Segawa Jokô II, on the kaomise drama "Monomi Guruma Yuki no Takadono", which welcomed back in Edo the actor Nakayama Tomisaburô I, Onoe Shinshichi II and Nakayama Kamesaburô. 2nd lunar month of 1811: Washichi worked in the same theater on the new year sogamono drama "Shinbutai Sakae Soga"; the role of Kudô Saemon Suketsune was played by Ichikawa Ichizô I and the roles of both Soga Gorô Tokimune and Soga Jûrô Sukenari were played by Ichikawa Omezô I. 1st lunar month of 1813: he went back to Ôsaka and worked at the Kado no Shibai, along with Nagawa Harusuke I, on the ni-no-kawari drama "Ane Imôto Date no Ôkido", which was produced by Ichikawa Zentarô and starred Kataoka Nizaemon VII, Arashi Kichisaburô II, Nakamura Karoku I, Arashi Tomisaburô II and Asao Kuzaemon I. 11th lunar month of 1813: Washichi worked at the Moritaza, along with Tsuruya Nanboku IV and Hon'ya Sôshichi, on the kaomise drama "Gohiiki Tsunagi Uma". 1st lunar month of 1814: he went back to Ôsaka, took the name of Ichioka Sadanori and worked at the Naka no Shibai on the ni-no-kawari drama "Keisei Kane ga Sakura", which was produced by Nakamura Utagorô and starred Nakamura Utaemon III, Kataoka Nizaemon VII, Ogawa Kichitarô III, Nakayama Bungorô I, Nakamura Daikichi I, Nakayama Yoshio I, Nakayama Hyakka and Nakayama Shinkurô III. 11th lunar month of 1814: Sadanori worked at the Kitagawa no Shibai, along with Nagawa Harusuke I, on the kaomise drama "Tsugi Awase Ekiji no Ume". 1st lunar month of 1815: Sadanori workedin Ôsaka on the drama "Akiba Gongen Kaisen Banashi", which was produced by Kataoka Ichimatsu. No record afterwards. Ichioka Sadanori was an important Kamigata playwright who was active from the end of the second half of the 1790s to the first half of the 1810s. He worked for three majors actors, Ichikawa Danzô IV, Ichikawa Ichizô I (Ebijûrô I) and Kataoka Nizaemon VII. Others sakusha were Machimoto Rihei, Namiki Harusuke and Egawa Sadashichi. Others sakusha were Namiki Miyosuke, Namiki Jûsuke, Nagawa Ujûrô and Ichioka Rihei.